Shipment to El Salvador by bus! Celebration as a life-saving mammogram machine arrives! Drilling Water Wells & Helping Orphanages! Three shipments in 12 days! El Salvador orphanage gets a van! Clinic in Nigeria gets help from Project S.A.V.E. American Samoa says "thank you!" Chico Project S.A.V.E. (Salvage All Valuable Equipment) brings hope and help to those in need, both locally and around the world. We are usually at our storage units at 2553 Hwy 32, Chico, CA, East & 32 Mini Storage, each Tuesday from 9-12 AM . Shipment to Syrian refugee camp in Beirut, Lebanon 5/20/17. Papua, New Guinea shipment completed 5/23/17. Viet Nam shipment completed 9/8/17. Malabalay, Philippines shipment sent 11/2/17. Kampala, Uganda, Africa, shipment sent 2/2/2018. Owerri, Imo State, Nigeria, Africa, 5/9/18 (see pictures below). Shipment to Nigeria, Africa 1/2/19 including an ambulance! Shipment to Liberia, Africa 1/18/19. 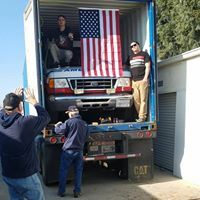 20 ft. container to Papua, New Guinea 3/28/19. Project S.A.V.E. (Salvage All Valuable Equipment) collects, then re-distributes, quality recycled medical and dental equipment and supplies both locally and around the world, free of charge, in an effort to help people receive needed care who otherwise might not. 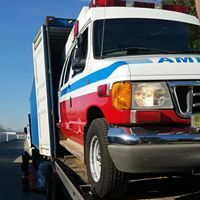 The organization was founded in 1996 by Dr. Phyllis Cullen, saving supplies and equipment for physicians going on medical missions, and has been directed since 2004 by Chico, CA, resident Janice Walker. The staff are all volunteers. Shipping costs are paid with tax-deductible donations. Since its first shipment from our garage in 2004, Project SAVE has collected, stored, inventoried, loaded, and shipped the equivalent of more than 192 twenty foot containers of recycled medical, dental and other supplies estimated at over twenty million dollars to 44 countries and people in need around the world, as well as to many local individuals, families and organizations. These supplies were otherwise designated for land fills but became valuable assets for struggling hospitals and clinics in under developed countries. Unpaid volunteers have donated 1,000's of hours of time and effort on Project SAVE's behalf over the years. Many of our stories can be found on this website, although it would be impossible to document every challenge, every triumph, and, of course, inevitable set backs. Please visit often to read our stories. And, of course, donations of time, labor and funds are always welcome and greatly appreciated. "We did not have wheel chairs to move patients so we used wheelbarrows." Dr. Bill McCoy, Papua, New Guinea. "When we ran out of sutures we used fishing line." Dr. Eugene Cleek, Camaroon, Africa. "We had to wash out our rubber gloves, hang them on a clothes line, and re-use them. A size 5 1/2 glove would expand to a 7 1/2 size after several washings." Dr Alan Melicor, Malaybalay, Philippines. Jim's Towing donated their services along with a flat-bed tow truck to guide us backing the ambulance into the container. A 1/4 inch to spare!!! ​The loading begins for the 5/9/18 Nigerian shipment. New donations for September 2016, 2017, 2018. Project S.A.V.E. is rejoicing in a gift from the American Endowment Foundation, thanks to the generosity of a private individual. We are so grateful! In addition we have received several truck loads of equipment and supplies from Enloe Medical Center and JM Keckler Medical Co. This has been an amazing week of blessings for us. Thank you! More recently we have recently been the recipients of over 150 pallets of consumable supplies as Medline Industries has moved their warehouse from Fairfield, CA, to Tracy, CA, and donated their excess goods to us. The Freemont Hospital in Yuba City, CA became available with numerous hospital beds, gurneys, and other supplies obtained. This was a direct answer to our prayer request for supplies to meet our numerous requests. Recent stories from Project S.A.V.E. Sheryl's Story: "Christmas in July"
Please click on the link below to read more about this inspiring story, and how Project SAVE played a part. Some of our hospital supplies come from the government; but with budget cuts and supply shortages, we rely heavily on donated items. Lately, we have been short on sterile gloves, sutures, dressing gauze, IV fluids, essential medications… pretty much everything. So you can image our joy when a 20ft shipping container arrived this week packed full of donated medications, surgical supplies, dressing supplies, and much more. It was like Christmas in August! ​Click here to read Sheryl's complete story.